A car-free day for London? Breathe it in. A group of plucky individuals from across London have got together to promote the concept of a car-free day for London on Saturday 22 September. Don’t worry – they don’t aim or wish to grind London to a halt. The idea is for some carefully chosen major roads to close – and for local people to join in on their own streets across London where possible and popular. The idea could then develop and grow organically, based on what works. They have written to Cllr Wesley Harcourt to see if Hammersmith & Fulham Council will support the concept. King Street in Hammersmith is in their “other” targets. The group has also written to Mayor of London, Sadiq Khan, asking for his support. They hope to develop a web page soon. Meanwhile you can follow and support them on twitter here. Here are some amazing images of Paris’s annual car free day. I tried to find some good images of London car-free but resorted to a lovely old painting. We should aim for similar tranquility. A few years ago I wanted to plant some spring bulbs along the Talgarth Road at the southern end of Avonmore. 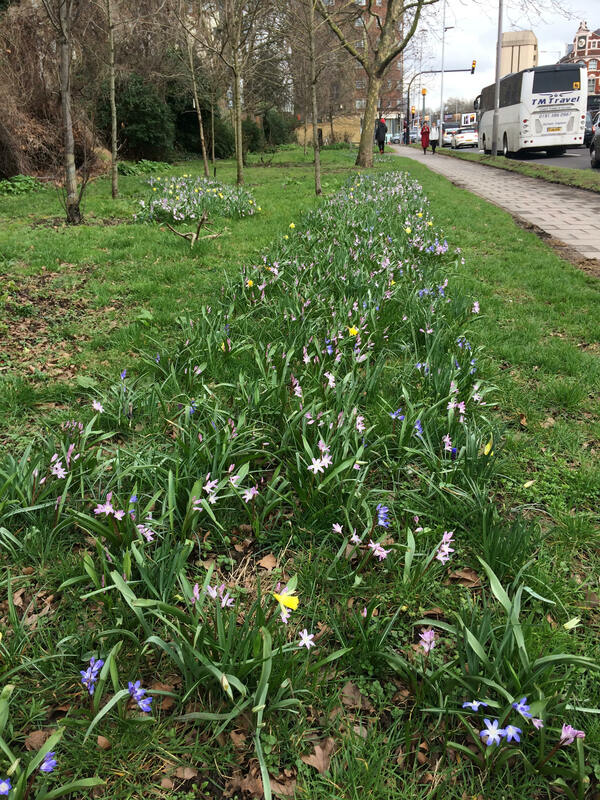 I put in a call to TfL – and managed to get through to the right person – that’s right – I managed to speak to the man whose job it is to plant spring bulbs on TfL land. Nice job. He came and looked at the area – and 36,000 bulbs were planted. Thank you TfL. Now flowering for their third time they look as good as ever. 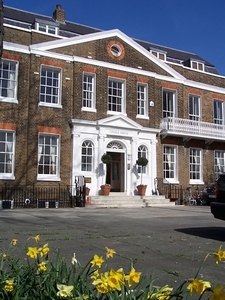 A local museum for Avonmore & Brook Green? Most people living in the Avonmore, Brook Green, and Sinclair Road areas know that Olympia has a new owner, headed up by the Yoo Group. Yoo Group has extensive plans for Olympia including opening it back out into its separate historic buildings with open space, trees, cafes running between the buildings and accessible by the public. When I have met with the new owners we have also talked about opportunities for theatres, galleries, museums. One of the ideas I am keen to push is a museum of the local area. We have so much history beneath our feet and all around us. Imagine if school children could visit a local museum and be encouraged to understand and appreciate the wealth of history and beauty right here? Imagine a space that opened daily that provided a nucleus for all the local artists, archivists, and amateur historians who seek to explore and preserve our area’s past? One of the obvious opportunities is to show some of the Cecil French Bequest. 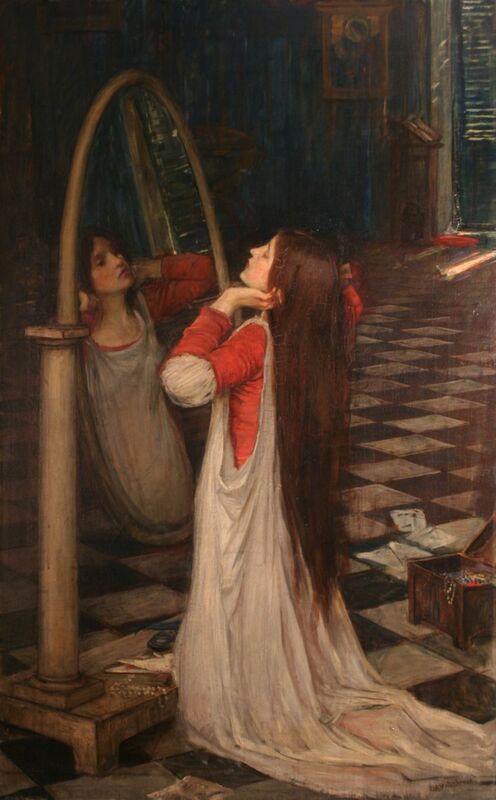 I expect most local residents do not know that Hammersmith & Fulham Council owns some of the most important and beautiful pre-Raphaelite paintings that exist. They were bequested to the Council by Cecil French in 1953. Edward Burne-Jones lived just off the North End Road for many years and his home “The Grange” was a gathering place for pre-Raphaelite artists. A local museum would honour Cecil French’s bequest and bring some of the paintings home. As part of exploring this idea I visited Hammersmith & Fulham’s archives which are housed nearby. We have an extensive collection of maps, photographs, paintings, and records in storage. All longing for a bit of air and appreciation. Part of the Cecil French collection is currently on display at the Watts Gallery in Surrey – and Hammersmith & Fulham residents can attend for free. Hire a bus! Residents in Avonmore & Brook Green have expressed concerns about the results of the TfL CS9 consultation – found here. With 59% of respondents supporting the scheme it appears to be a slam-dunk to go ahead. Anyone who follows politics in H&F will know that the Labour administration claims to do thing “with” residents, not “to” them. In November last year the Council agreed to accept residents’ comments on the cycle superhighway. This year, in late January, it held a “PAC” meeting which looked at the CS9 scheme and which the public could attend. The report tabled is here. Despite the huge interest in this matter, the report provided no information whatsoever on the results of the H&F consultation. This is not doing things “with” residents – this is keeping information “from” them. It would have been entirely possible in late January to make public the headline results from the local consultation. It would be even more possible to do so now. This should happen quickly. Firstly, we need to see the responses broken down by postcode. Within Hammersmith, CS9 would run through W14 and W6. Only 18% of the respondents were from those areas – about 660 respondents. (This leaves out those who did not identify their postcode.) TfL should make visible the results broken down by postcode so we can see what people who live near the proposed route think of the scheme. Secondly, we need to see the responses broken down by those who cycle and those who don’t. 65% of the respondents to the consultation said that they cycle. This is against the fact that fewer than 5% of all road users are cyclists. This is therefore a hugely biased response, and all credit to the cyclists for responding. But TfL needs to weight the responses so that they are proportional to the road user population – and then make that analysis publicly available. I have found in Avonmore & Brook Green, that most people would like to see more cyclists on the roads and fewer cars; less congestion and cleaner air. Who wouldn’t? But when I meet people who have studied CS9 closely, they usually have grave concerns. This includes many cyclists. …It must be understood that a design of this nature is unprecedented in this country. There are very few examples of two-way cycle tracks with priority over turning motor traffic, and even fewer on two-way streets with frequent side road junctions. There have been schemes on one-way roads, where junctions and turning movements are simpler … but these have suffered the safety problems experienced in other countries. There are also one or two examples of substandard junctions on the recent Cycle Superhighways in London, but generally at very quiet side roads, and certainly nowhere near the 28 side roads on the CS9 two-way track proposed for Chiswick High Road and King Street. … I strongly urge the Council to work with TfL to re-explore the possibilities of one-way tracks on either side of the road, that are more carriageway based, possibly with light segregation from motor traffic. This is likely to be the only real way of resolving side road junction safety. The alternative is to introduce five metre long waiting areas between the cycle track and road at each junction and to ensure good visibility particularly of “wrong way” cyclists by drivers emerging from side roads. Given that this entails finding at least an additional 4-5 metres road width at each side road junction, it is unlikely to be feasible and is in any case only a mitigating measure, with some risk remaining. It also does not deal with issues of pedestrians being able to safely and intuitively cross the track on these busy high roads. If a two-way scheme is to be progressed, I strongly urge the Council to insist that TfL fully explain why the public consultation design diverges from their own safety standards and provide a full safety analysis and risk assessment prior to any further design work. … This is particularly pertinent on King Street because over 90% of cycling collisions occur at or very close to the junctions. Residents deserve to know what they are voting for. The Conservatives have made clear that they will not support CS9 in its current form. Voters in LBHF need to know where Labour stands. Very sad to hear that Tom Ryland, the Chairman of the Hammersmith Society, has died. “It is with great sadness that I have to report the news of the death of our Chairman, Tom Ryland RIBA. Tom died peacefully on 9th March in Hammersmith Hospital. It is hard to imagine the Hammersmith Society without Tom. He had been on the Committee for many years, and Vice Chairman for some twelve years, before becoming Chairman nearly three years ago – a role to which he brought his knowledge as an architect, a lively interest in local affairs and a belief that it was always possible to do things better. His wisdom, and his calm, balanced approach to planning issues were an immense asset to the community. Working with Tom was always a pleasure. He was unflappable, interested, sociable, kind, and had a wonderful quiet sense of humour. He had a great gift for getting people on his side, and committee meetings with him at the helm were enjoyable affairs. He will be hugely missed by the very many people across the wide range of activities he gave his time to. We extend our thoughts and all our sympathy to his wife Liz and all his family. Friends Groups transform local green spaces. They bring local people into the care and management of those spaces – and ensure that the very people who the space is for, have a say in their care and development. Friends Group to whom park users owe a vote of thanks include The Friends of Brook Green, Marcus Garvey Park, and Margravine Cemetery. The Friends of Gwendwr Gardens is up and running (for contact details please email me), and the latest addition is the Friends of St Pauls Open Space. Last week local councillors, council officers, and the local residents leading the charge, met at the park to discuss plans and priorities for the Open Space. The area has a beautiful Grade II listed bothy – and I would like to say that we creaked open the door for the first time since 1886 to find the hardwood gardening tools in situ. But that wouldn’t be true. We creaked open the doors for the first time in about five years – and peered at the re-inforced concrete in the interior. But the exterior of the bothy is stunningly beautiful and all present agreed that its preservation and care is the top priority for the Friends Group. Maybe many priorities down the track we will be able to remove the reinforced concrete inside and open a small cafe. 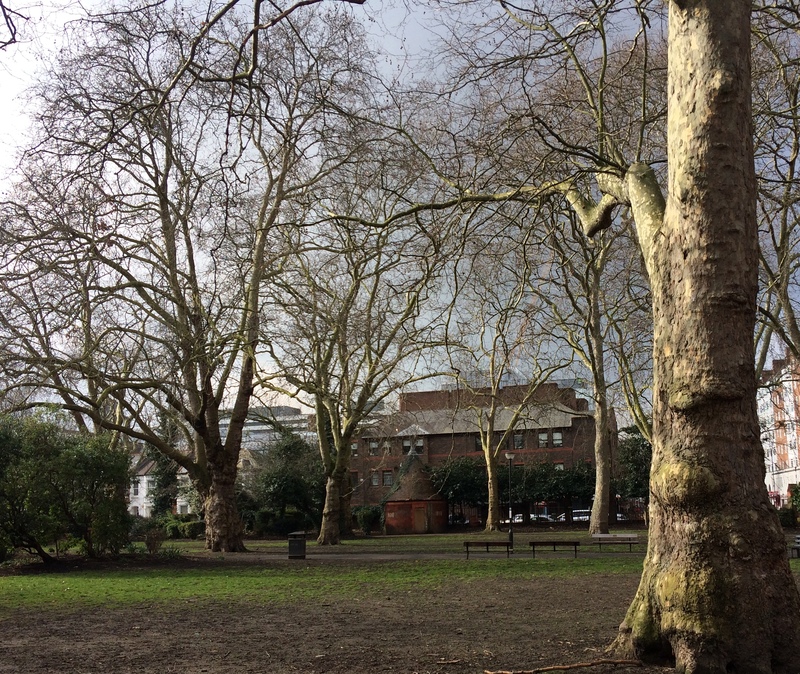 Parks officers explained that one of the mature plane trees likely needs to be removed entirely. Others need pruning to let light back into the grassed areas. We walked around the south-western boundary where officers agreed to reinstate a path – which will help to protect the grass. And new mostly-native planting will be done on either side of the path to encourage insects – and look good! I pay tribute to the parks officers who are incredibly knowledgeable. They brought to the meeting, many historic pictures and maps of the park – including photos taken by the Luftwaffe. Apparently the two airforces (?) have undertaken aerial photo exchanges of material dating from the war. It was a pleasure and a privilege to spend an hour with the parks officers. They explained how native dandelions were used to make rubber for the war effort…. I do not believe there was a plant species in the park that they could not name immediately. 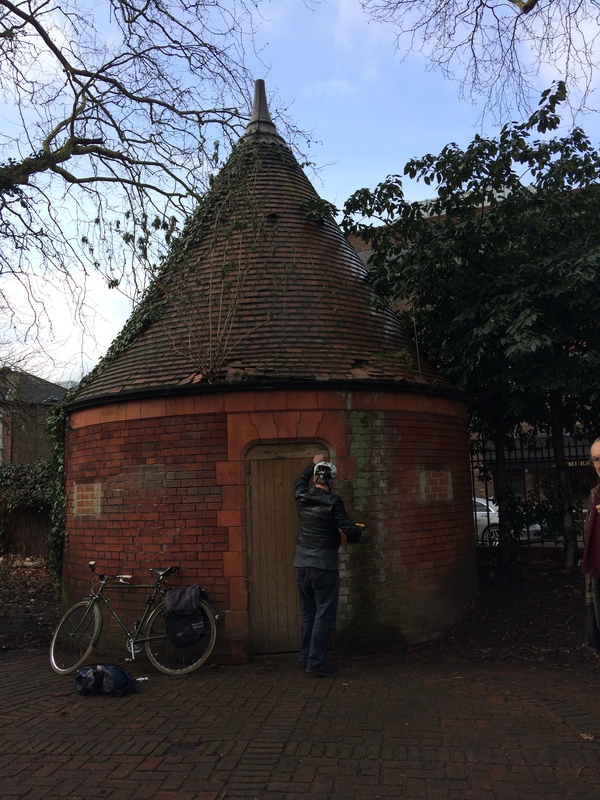 The Friends of St Pauls Open Space is up and running – and will make a big difference to this lovely space. Please email me if you would like to join this – or another of our “Friends” Groups: carolineffiske:@gmail.com.